Sometimes dinners are quite involved around these parts. There's something wonderfully calming about making sure to follow each step in a complicated recipe, especially if you have time on hand and either good conversation, good music, or good silence for company. "Good silence?" you ask. Yes, good silence. I'm all for blasting the music while I chop onions (ugh - can someone come up with fresh and tasty yet super cheap pre-sliced onions already? I'm sure sometimes D comes home and thinks that something horrid has happened and all that is near and dear to me has been destroyed in one fell swoop, because I'm sobbing my eyes out over a blasted onion), especially if it's something I can sing along to (although that necessitates nobody else being around - I wouldn't subject my worst enemy to that ordeal! ), but sometimes it's nice to just hang out with your own thoughts for a minute while you prep a dressing or a marinade, ya know? It's the perfect time to think about BIG LIFE DECISIONS if you didn't mull over them enough in the shower. Or to reflect on questions of high importance, such as whether your plants are silently judging you for forgetting to water them until they start wilting and drooping quite conspicuously. Or to ponder a variety of "would you rather" situations. High entertainment, I tell you! In any case, despite my love of multi-ingredient multi-step recipes, when you've already got a main dish that's taken some prep work to do, you need a side that just isn't that detailed. That's when you need potatoes. Tiny, adorable, baby golden potatoes. Potatoes that don't need any attention. 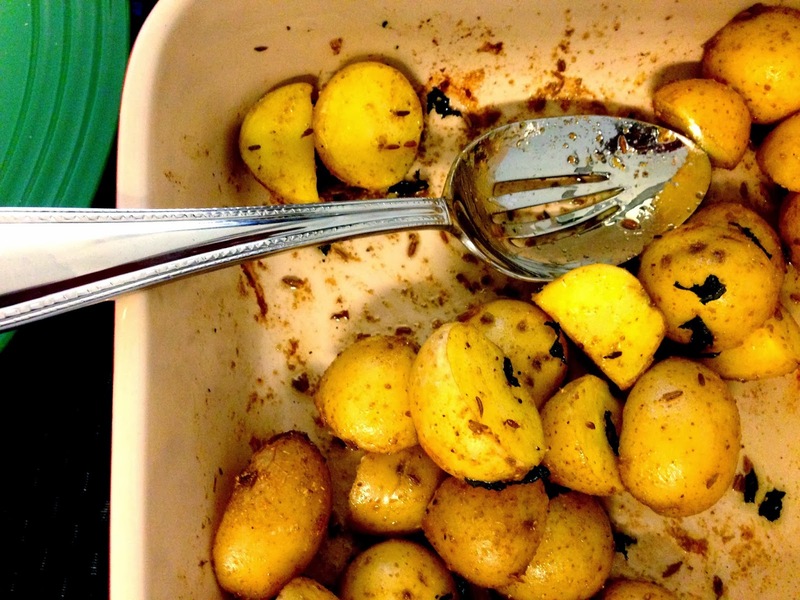 Potatoes that complement everything. Potatoes that can be made in 3 steps: cut, toss, roast. These are those potatoes. Scrub, dry, and cut the potatoes into halves. They should all be about the same size, but if you have any larger ones, go ahead and quarter them so they all cook at the same rate. Roughly chop the mint. 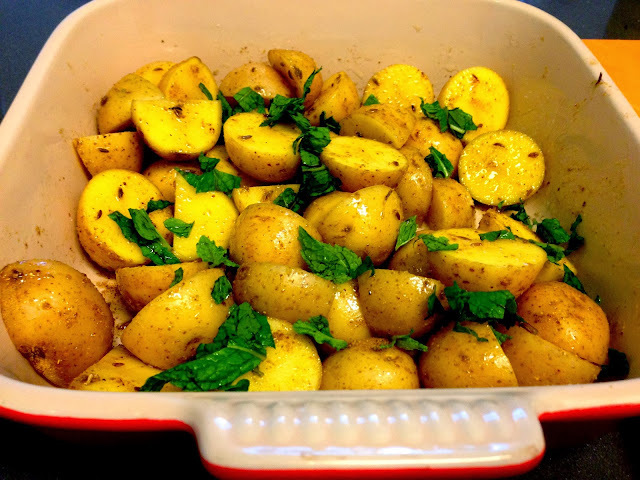 In a baking dish, toss the potatoes with the spices, salt, mint leaves, and olive oil. Roast at 400 for 40-50 minutes or until tender (a fork stabbed into the center of a potato should go in easily). Garnish with fresh mint leaves just before serving.